Global accounting firms are on the path to recovery in a year that welcomed a new leader of the pack. 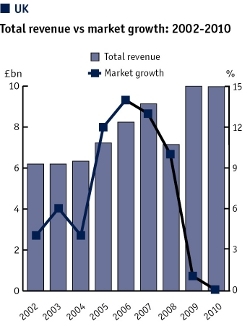 While 2009 will be remembered as a year of hardship and revenue contractions, the past 12 months has seen growth return, albeit at much more muted levels than pre-financial crisis days. Of the 44 global networks and associations surveyed, 60% reported either US dollar growth or flat revenue on their 2008/2009 fiscal year results. The combined revenue of global firms was $144bn, which is not quite a return to the glory days of 2007/2008, when the group generated revenue of $152bn. What these results highlight is a steady recovery for global firms, despite challenging trading conditions in the US and UK – the two largest accountancy markets. Much of this growth is being fuelled by the key emerging economies China, India and Brazil, where global firms are being rewarded for investing heavily. Audit and accountancy services performed admirably among the top 10 global networks, while advisory and consulting proved a mixed bag. Risk management, internal audit and due diligence services are in demand but corporate finance and IPO work is still at a lull although firm leaders expect activity to return as the M&A market continues to pick up. Cross-border tax advice, including transfer pricing, proved to be the service with the most consistent growth. In terms of litigation, 2010 was a better year for global firms than 2009, but troubles in Ireland could lead to more litigation this year. The spread of IFRS is motoring along and providing opportunities in many Asian markets for firms, while it now seems that the US will adopt and it unveils its roadmap this year. 2010 is also the year the role of the auditor came under the spotlight as politicians in the EU and UK review the audit industry and its future path. There has been a minor reshuffle in this year’s global top 10. 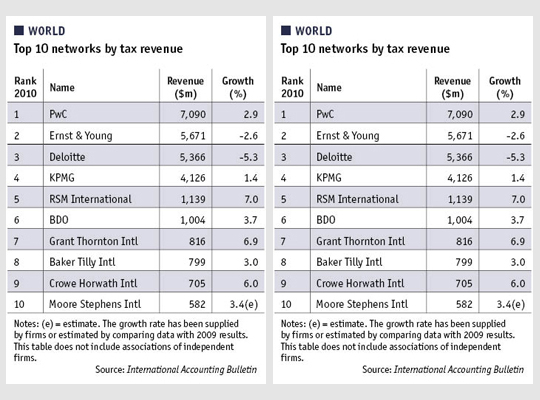 Deloitte has taken pole position for the first time from rival PwC and PKF International has moved into tenth spot. Deloitte became recognised as the highest earning network in October when PwC released its results. The difference between the two networks is staggeringly small – Deloitte’s revenue was $26,578m while PwC brought in $26,569m. In 2009, PwC earned $71m more than Deloitte but this year PwC is $9m behind.